NIIFT has an excellent collection of books and journals related to the field of Fashion, Art, Management and Technology. The library is well equipped with a large array of books, journals and published resources of Indian & Foreign authors. 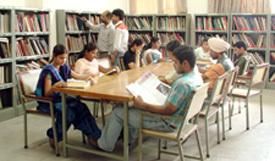 The organization of library at NIIFT is based on the modern concept of librarianship. It consists of books and other published resources of Indian and Foreign authors and publishers covering its educational programmes and related subjects. It subscribes to leading Indian and International Textiles, Fashion and Apparel Journals and Fashion Forecasts services. It has a large collection of Video Tapes, Slides and Photographs on fashion and garment production related topics. Industry personnel and others attached to the fashion industry can also avail the reference facility offered by NIIFT. In the new millennium, the success rate of the Fashion designers/Professionals rest on their ability to integrate Fashion Information and Technology. NIIFT library provides the necessary infrastructure to collect and disseminate the information to its reader. NIIFT, Mohali also provides services to Fashion Professionals and Industry, related to their fields. NIIFT Library also subscribes the latest journals, Forecast for its library. Audio-Visual material in CDs, Slides, Video tapes are the basics for any course and used as a Primary Teaching Aid. The material in the shape of Audio-Visual in the field of History of Costumes, Fashion Illustration, Garment Manufacturing and Design Collection of NIIFT Graduates are also stored in the Library.